On January 5, we celebrate the feast of St. John Neumann. A simple, slight (he was barely 5-feet-4-inches tall) man from Bohemia, he became a great saint. Among his many claims to fame, he was the first man to profess vows as a Redemptorist in the New World. He served for a brief time as one of the leaders of the Redemptorists’ American mission headquartered in Baltimore. He became the fourth bishop of Philadelphia, and quickly built a legacy as the founder of the parochial school system in the United States. He died of a heart attack on a Philadelphia street corner on January 5, 1860. Neumann was beatified on October 13, 1963 during the Second Vatican Council, and proclaimed a saint on June 19, 1977 by Pope Paul VI. For the third consecutive year, the Redemptorists are sponsoring a nationwide essay contest for Catholic school students in grades 6-12. Essays must be received by Friday, March 1. Click here to download the essay theme and contest guidelines (PDF). 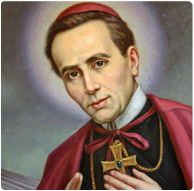 During the Year of Faith, St. John Neumann was highlighted by the U.S. Bishops as one of 12 American saints and blesseds chosen as special patrons throughout the Year.